Hello, everyone! We’re getting really close to Christmas! I’ve got nothing wrapped and just now started on my Christmas nails. And I’m doing them in bed. It’s gotten a little messy. I have three more Christmas manis to show you! Let’s get to them, shall we? Here we have a simple sweater mani. I had always failed at stamping these, so this turned into a pleasant surprise! I really loved the look of the iridescent glitter over Dorothy Who? by China Glaze. I definitely needed some better quality rhinestones for this mani. This was inspired by @stephs_nails on Instagram. I so love her work. 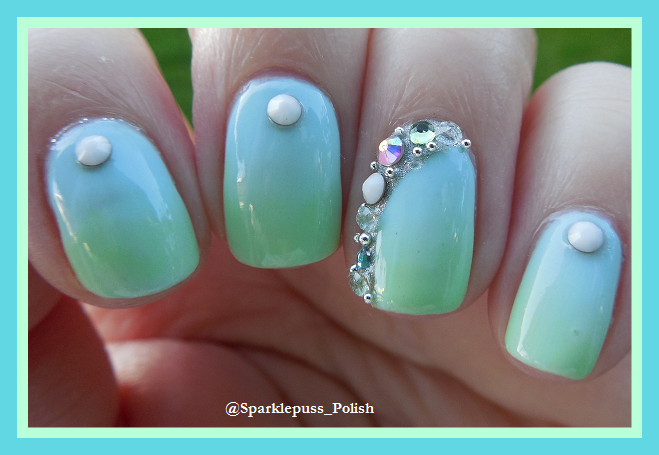 I actually found another mani similar to this last year. When I looked closer I found that they were inspired by the same picture I was! There you have it! My next couple posts depend on when my nugget falls asleep and how bad my back hurts from wrapping! If I don’t blog at you all before then, have a great holiday! You’re a brave soul for doing nails in bed, lol. These are all stunning! Hahahaha, yeah, doing them in bed is a little precarious….